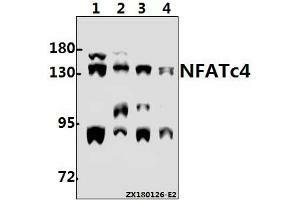 Specificity NFATc4 (N670) polyclonal antibody detects endogenous levels of NFATc4 protein. Immunogen Synthetic peptide, corresponding to amino acids 635-689 of Human NFATc4. Background NFATc4 (nuclear factor of activated T cells, cytoplasmic, calcineurin-dependent 4) is a member of the nuclear factors of activated T cells DNA-binding transcription complex that influences cytokine gene expression, cardiac hypertrophy and adipocyte differentiation. This complex consists of at least two components: a cytosolic component that translocates to the nucleus upon T cell receptor (TCR) stimulation and an inducible nuclear component. Other members of this family participate in the formation of this complex. NFATc4 plays a role in the inducible expression of cytokine genes in T cells, including the induction of IL-2 and IL-4. p38 MAP kinase phosphorylates multiple residues in the NFAT homology domain of NFATc4. Buffer 1 mg/mL in Phosphate buffered saline (PBS) with 0.05 % sodium azide, approx. pH 7.2. Storage Comment Store at 4°C short term. Aliquot and store at -20°C long term.